Share the post "Callicarpa Americana Or American Beautyberry: Gardening"
If you are looking for a plant which is easy to grow and propagate, bring the American beautyberry or Callicarpa Americana to your garden. Pretty cascading arching branches, soft pale green leaves, clusters of lavender-pink flowers and unusual violet purple berries, which hug the branches at leaf axils and last after the leaves have fallen are the main selling points of this hardy deciduous shrub and provide nearly year-round interest. Mature specimens are usually large, bushy and develop either a horizontal or upright habit. Native populations exist in open woods, moist thickets, wet slopes, low rich bottomlands, swamp edges, and coastal woodlands. Butterflies are attracted to the summer flowers and songbirds eat the fall fruits. Foliage is a favorite of White-tailed Deer. Japanese (Asian) beautyberry (Callicarpa japonica) and Chinese beautyberry (Callicarpa dichotoma and Callicarpa bodinieri) are usually smaller less heat tolerant than American varieties, and cold tolerant to zone 5. Asian beautyberries can sometimes be invasive. Soil:Clay, Loam, Sand, Acidic, Neutral. Add compost if the soil is poor. Moisture: Drought Tolerant, Average Water (more sun, the more water plants will need). Moist but Well-Drained soil. Propagation: From cuttings; from seed. Fertilizer: Too much fertilizer will result in fewer berries. Edible: Fruit. The raw berries, while palatably sweet, are suitable for human consumption only in small amounts, because they are astringent; they are also used in jellies. The roots are used to make herbal tea. Beautyberry berries are mealy and almost flavorless. According to some sources, beautyberry jelly is exceptionally good. See some recipes and some good information about Callicarpa americana (American beautyberry) here. Medicinal Uses: A decoction of the root bark has been used as a diuretic. The leaves are a cure for dropsy. A tea made from the roots is used in the treatment of dysentery and stomach aches. A tea made from the roots and berries is used in the treatment of colic. Some native North American Indian tribes used leaves and roots in sweat baths for the treatment of malaria, rheumatism and fevers. Other Uses: American beautyberry or Callicarpa americana has been found to be a natural insect repellent. The chemical ‘callicarpenal,’ extracted from American Beautyberry, has been patented by the United States Department of Agriculture Research Service as a mosquito repellent. Callicarpenal and other compounds isolated from the plant also repelled fire ants and ticks, proving the worth of the centuries-old practice of placing leaves under mule harnesses to deter biting insects. But remember it’s the oils/compounds in the leaves that repel, not just having the plant in the yard. Tips: Requires cross-pollination for good fruit production. Can be pruned severely right before new growth begins in the spring. 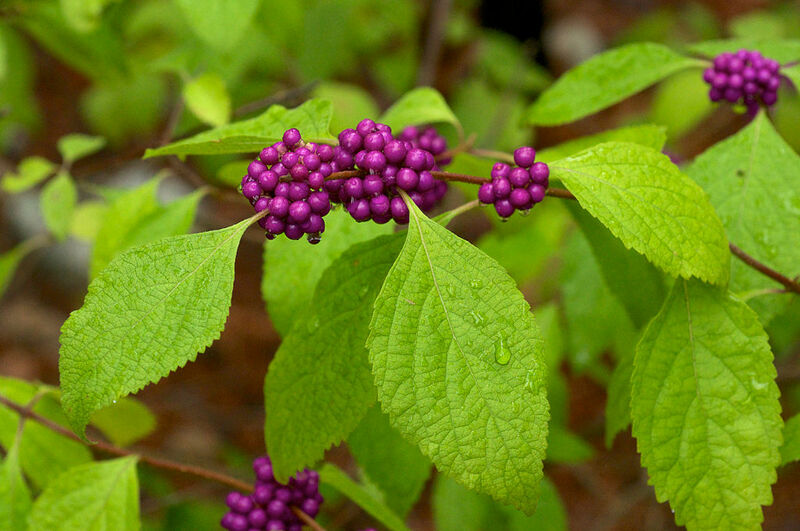 American Beautyberry can be cut nearly to the ground each winter to encourage more compact growth, flowers and fruit. It can also be left to mature naturally into a tall woody shrub. Do you grow Callicarpa Americana (American Beautyberry) in your garden? What is your experience with this plant? Please share with other fellow gardeners in the comments below! Do you sell Callicarpa Americana (American Beautyberry) seeds or have plants for sale? You can place your advertisement here. Contact us now!